Last February Dancing Pencils held a party with the theme “paradigm shift to success.” This February, the theme for the party was “success stories.” About 100 people attended the party, held at the SABC head office in the Blue Moon venue, on February 2nd. The wingspan of Dancing Pencils is huge. Representatives of organisations that Dancing Pencils works with who were in the audience included Tape Aids for the Blind, Early Childhood Development, the KZN Department of Education, the Deaf Association, the Office of the Premier, and associated Dancing Pencils Writing Clubs. Members of the DPLDP board were also present and the team. The theme of success stories included 10 speakers, all very different. 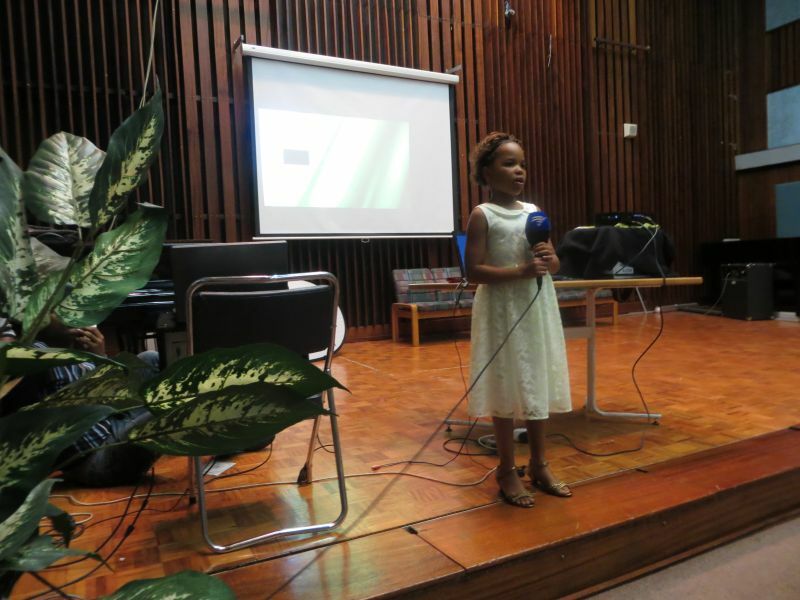 First we showed the video we made with Zekhi Zondo, now aged 8, as the heroine. This video was shown at her township school, and she is now the school Idol. She also did well academically, and after the video, she spoke to the audience. This was followed with talks by teen and adult authors. Ladysmith Senior Education Specialist spoke about the work she is doing in her district with nearly 500 schools, in which she aims to get Dancing Pencils Writing Clubs as she has seen the improvement in both writing and thinking that comes from involvement in a writing club. Councillor Sam Kikine from the eThekwini Muncipality spoke on the benefits of the right brain which he had discovered for himself. He also had brought Kwela Special Entertainers who played the guitar and danced for us. Sindi Dlamini spoke of the better world we aim at where we all work together in harmony without petty differences that divide people. Bonga Zondo concluded with an overall view of the benefits of Dancing Pencils and umSinsi Press. We thank our caterers for lovely breyani and our DJ for good music. We had many accolades for a pleasant evening that brought together so many different people all interested in a peaceful world where people achieve their potential and help others to do the same.